Wreck diving is a form of recreational diving where scuba divers explore sunken shipwrecks, crashed aircrafts and wreckage of other artificial structures. It combines the art of diving, marine life discovery, wreckage history and archaeology in one, making it a popular leisure activity among divers. Wreck dive sites like Milne Bay in PNG also offer divers a chance to uncover sunken treasures or artifacts at the bottom of the sea. Like in any other form of diving, wreck diving takes pride in the marine biodiversity that has grown around and inside a shipwreck. Some of the most breathtaking underwater habitat actually formed from wrecks that scuba divers dream of exploring. Many divers also find wreck diving interesting because they are intrigued with the sunken ship’s exciting or tragic history, not to mention the treasures they can find. They find the ambiance in the shipwreck fascinating where many people have likely lost their lives. Stories of the wreck add up to the excitement of the exploration, some even considered underwater cultural heritage and significant archaeological sites. Furthermore, a wreck dive site proves to be a challenge for divers especially for beginners. The procedure in this type of diving differs from others in a sense that it requires more training for the higher risks it possess. Non-penetration diving – divers only explore the outside of the wreck. This type does not require special wreck dive training or additional equipment, however, a special training lets divers maximize wreck sites such as PNG and enjoy the activity even more. Some wreck sites may be too unstable that only non-penetration diving is allowed. Limited penetration diving – divers may explore inside the wreck but they can’t go beyond where natural day light is. In this type, divers are required to undergo training as navigation is more difficult inside the wreck. Specialized wreck diving equipment is also needed such as redundant air supply, dive lights and penetration lines. Full penetration diving – divers may explore beyond the light zone inside the wreck. This type of wreck diving requires a specialized certification from agencies such as The Professional Association of Diving Instructors (PADI) and Scuba Divers International (SDI). Aside from certification, it also requires specialized gears such as diagrams of the ship, longer penetration reels and redundant air supply. Wreck diving poses different levels of hazards according to its type. For instance, shipwrecks are frequented by fishing lines, nets and ropes that may cause entanglement to non-penetration divers. On the other hand, penetration diving presents greater threats that can endanger a diver’s life. For example, divers are prone to getting lost and trapped inside the wreck, eventually leading to scuba tank running out of gas. Light failure may also occur, leaving divers submerged in total darkness. Fragile structures may also break without notice, causing injuries or even death. Because of these hazards, it is always advised to take precautionary measures when exploring wreck dive sites in PNG or in any other diving destination. 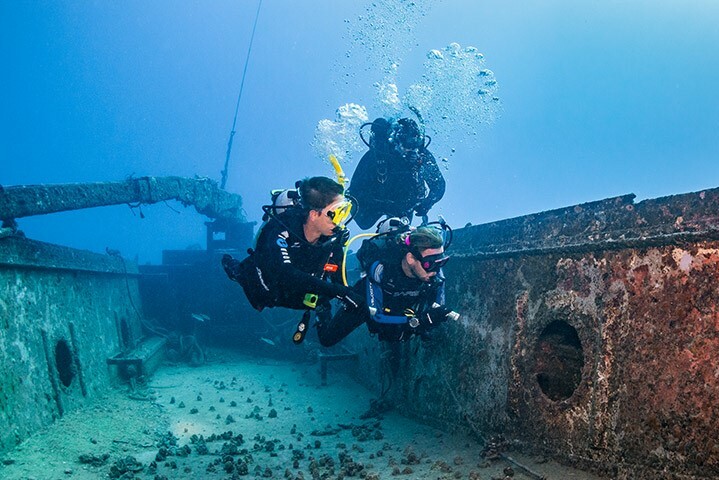 Many diving organizations such as PADI and SCI offer special courses to train scuba divers in non-penetration, limited penetration and full penetration wreck diving. Undergoing these courses lets divers learn valuable skills such as the proper use of guidelines and reels, proper air management and even archaeological abilities. Check out PNG diving sites here.